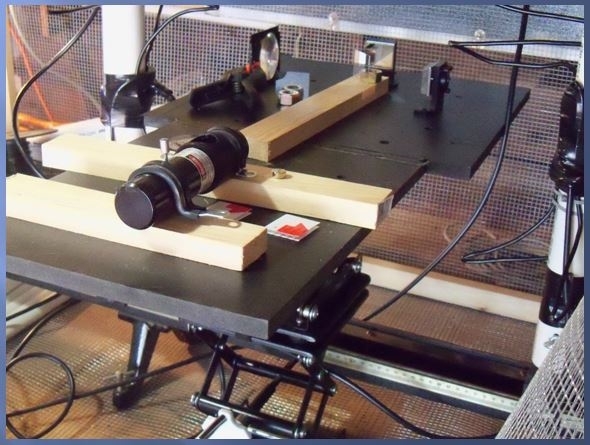 ►The Micro Warp Experiment uses the concept that when a laser beam is put into a crossed field generated by two tripole antennas the laser light will be compressed which will be indicated by the fringe patterns generated on the display screen from the laser based interferometer. ►A web cam will be activated when the fields are active and take snap shots of the fringe patterns which will be collected and analyzed. To determine if a fringe pattern changed, a fractal analysis program will be used as well as looking at the image brightness of the plate. 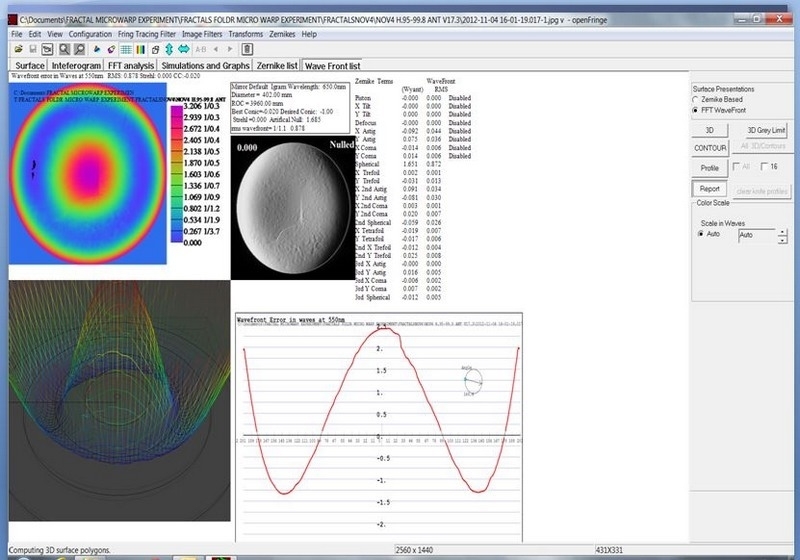 The collected data will be put through a comparator process to look for changes in brightness and the fringe pattern. Both of these techniques will be used to validate if the laser beam fringe pattern did compress. ►The equipment used is very sensitive and the fringe pattern result can display changes up to 1 in 3000. 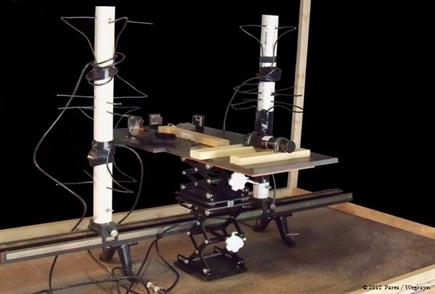 ►The tripole antennas replicate the internal electrical patterns in a thunderstorm. The resultant crossed fields will represent the process that is formed during the maturing stage of the storm. From Omaha Nebraska, on October 15th 2012 at 6:05PM the first confirmation of the existence of micro space warp was discovered. 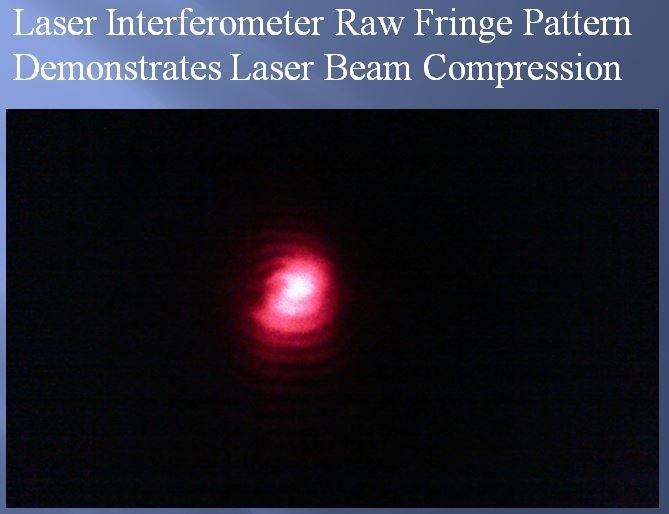 In an experiment that has, been in design and construction for over a year, produced the first artificially induced and detected compression of a laser beam while being directed through a micro warp field. 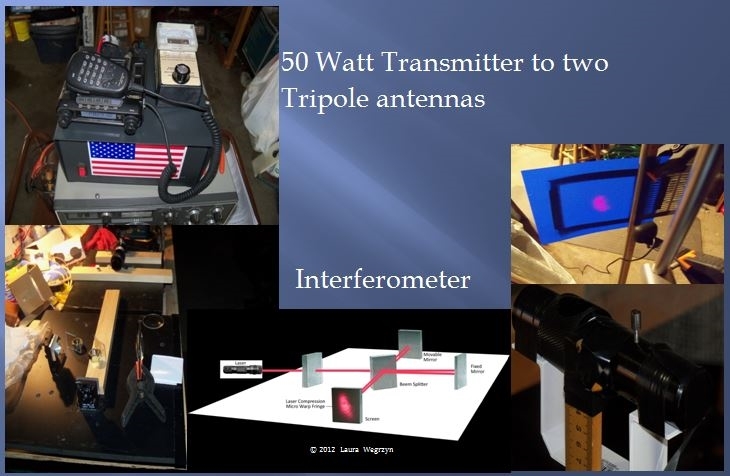 The data was obtained using a set of specialized tripole antennas through which a laser was directed to an interferometer, where a resultant fringe pattern was displayed and captured. 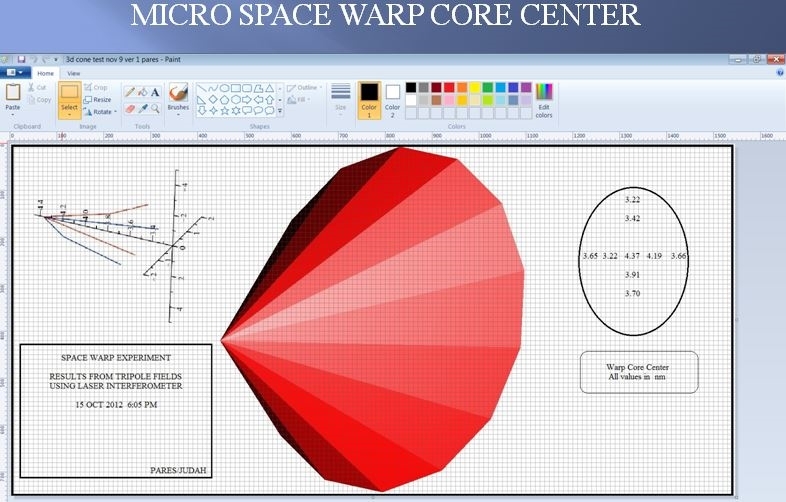 A collection of data points outlined the volumetric micro warp field and depicted the micro warp core. The team consisted of David Pares an Adjunct Meteorology Professor and Matt Judah a Physics Student at the University of Nebraska at Omaha. This discovery has some very far reaching implication, such as space flight within the solar system and beyond and terrestrial transportation of all types. 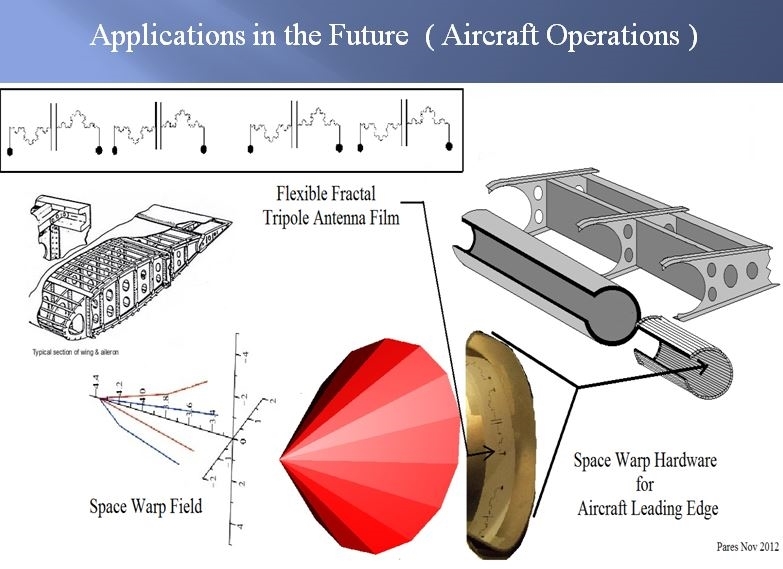 The next step is to construct a micro craft that will use some advance flexible fractal tripole antenna fields that can demonstrate sustained maneuvering of an autonomous micro craft. 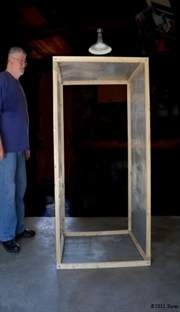 In 1994 Miguel Alcubierre came up with the Space Warp concept, in which he proposed a method in theory to cause the fabric of space ahead of a spacecraft to contract and the space behind it to expand. A ship would ride inside this region characterized as a local space warp bubble of flat space. Since the ship is not moving within this bubble, it is just carried along, as the region itself moves. Conventional relativistic effects are not violated since it is just the contraction of the metric of space in front of it and the expansion and return to normal space behind the object. A ship using this methodology could reach its destination faster than a light beam restricted to travelling outside the warp bubble. Some theoretical calculations indicate that it may be possible to go the equivalent of 100 times the speed of light in a space warp scenario. Up to now artificially inducing Space Warp has been limited to amount of power necessary to create it. Recently, scientists have estimated the power needed to induce space warp, such as, the equivalent energy of Jupiter and the latest calculation the equivalent energy of the weight of a Voyager Spacecraft. In a new ground breaking development, a micro space warp experiment has shown that sustainable micro space warp fields can be induced and measured using very low energy. 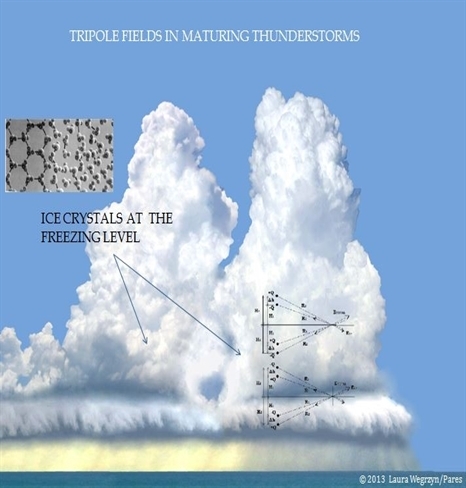 The Micro Warp experiment is a result of years of investigating pilot accounts, of induced local space warp or linear displacement while getting caught up into thunderstorm activity. 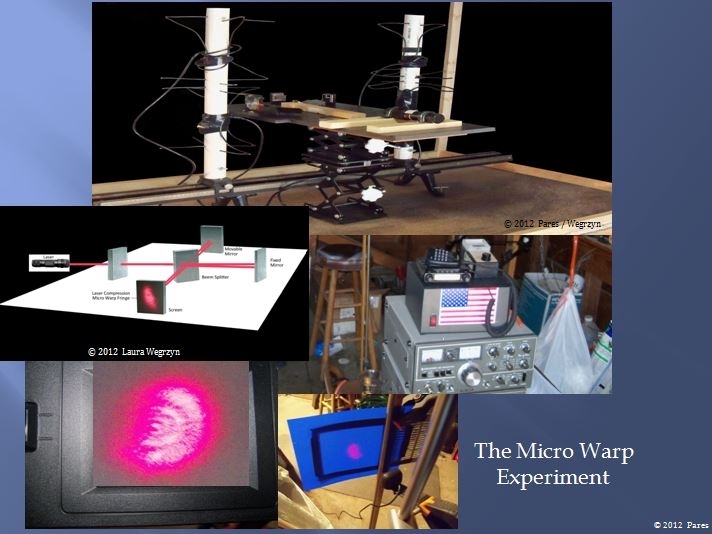 After evaluating these reports of a local space warp phenomena, it was concluded that even though there is evidence to support its existences, an experiment was needed to recreate, detect and measure in a controlled Laboratory environment. Getting the exact conditions in the atmosphere to recreate the situations needed, were going to be tough to do, as well as being very expensive to carry out. 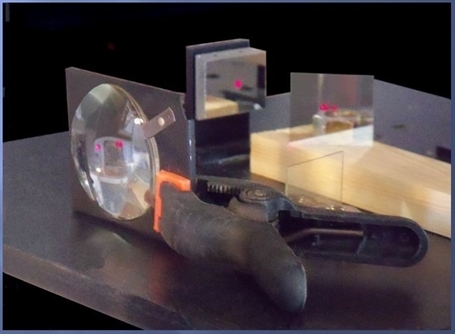 The experiment replicates the internal electrical structures in a thunderstorm and uses a laser based Interferometer to detect any aberrations in the resultant fields. 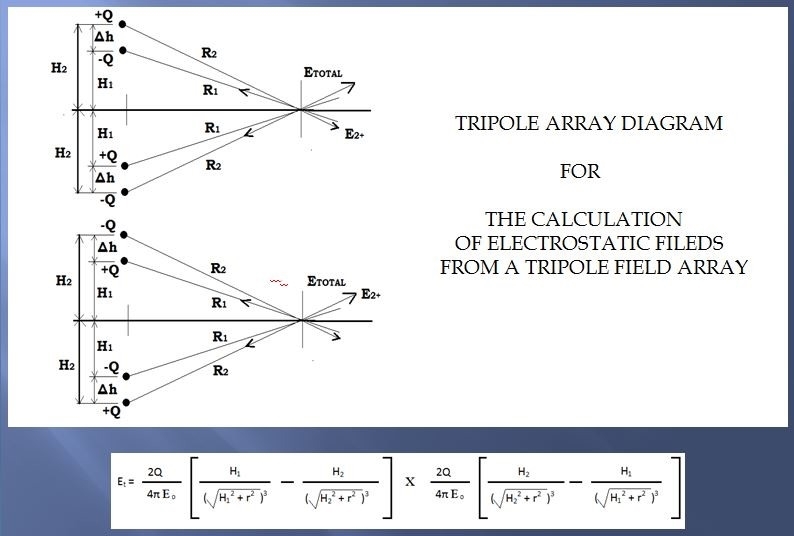 Specially designed Tripole antennas generate the fields in which a laser beam is then positioned between the four resultant crossed fields. 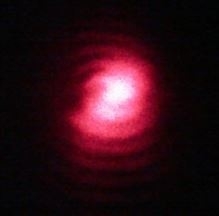 If subsequent laser light is compressed, the resultant fringe patterns generated will be physically displaced inward on the display screen using a laser based interferometer detector. The equipment used can display fringe pattern changes up to 1 in 3000. 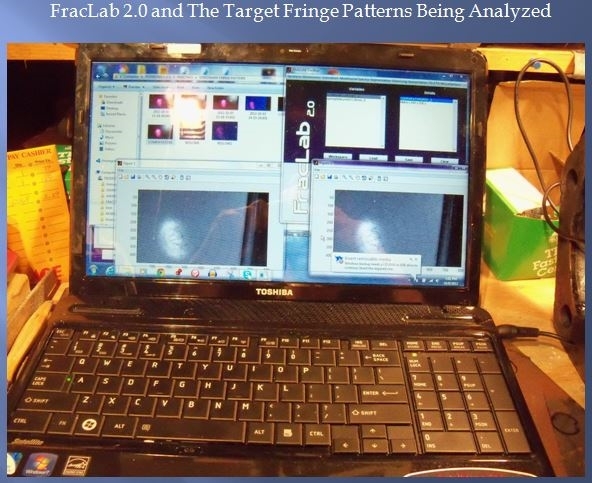 An HD web cam is used to take snap shots of the displayed fringe patterns which has been collected and analyzed. A fractal analysis program is used to examine the fringe patterns as well as looking at the image brightness of the individual pixels on the resultant plate. 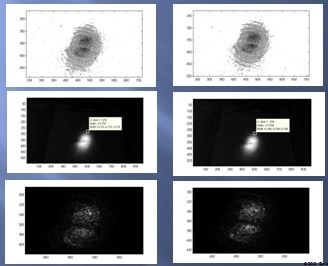 The collected data is then put through comparator software programs to look for changes in brightness and to determine if a compression of the laser generated fringe pattern can be detected. 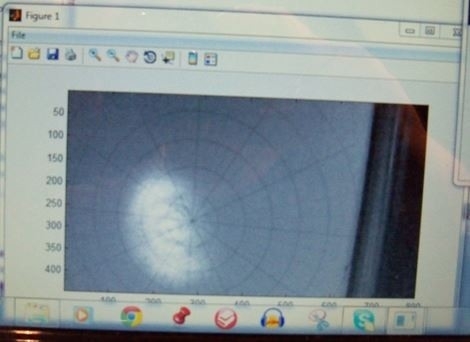 In addition individual points of data have been mapped out and plotted to determine the shape of the micro warp field as well as the amount of laser beam compression. 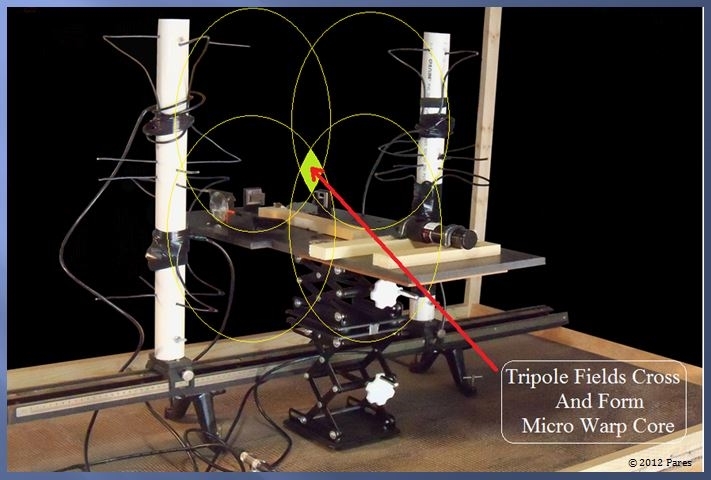 The Micro Warp Experiment uses the concept that when a laser beam is put into a crossed field generated by two tripole antennas the laser light will be compressed which will be indicated by the fringe patterns generated on the display screen from the laser based interferometer. 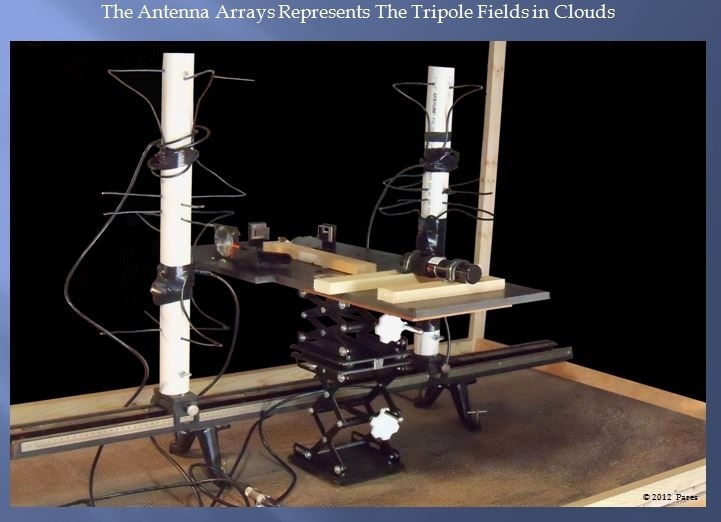 The tripole antennas replicate the internal electrical patterns in a thunderstorm. The resultant crossed fields represent the process that is formed during the maturing stage of the storm. As the thunderstorm develops there is an accumulation of oppositely charged particles within the cloud. 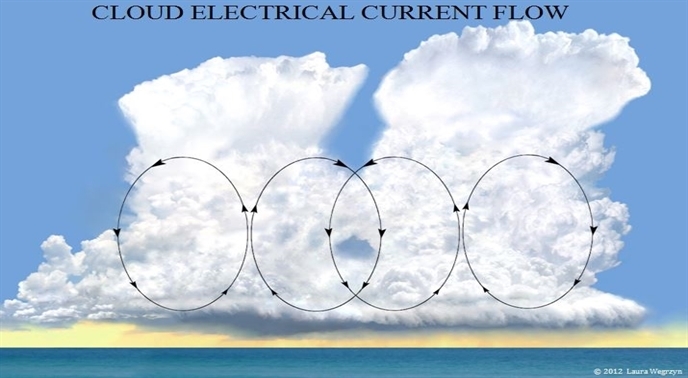 Positive charges moved to the top of the cloud and negative charges moved to the bottom. 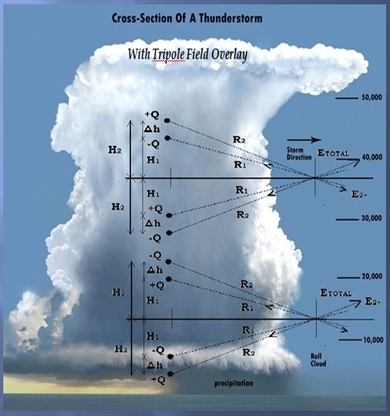 Large thunderstorms exhibit a tripole electrostatic structure which consist of a positive charge on the top structure of the cloud and a, main negative charge at mid-level and a region of smaller positive charge at the lower-level. The equipment used is very sensitive and the fringe pattern result can display changes up to 1 in 3000. A web cam will be activated when the fields are active and take snap shots of the fringe patterns which will be collected and analyzed. To determine if a fringe pattern changed, a fractal analysis program will be used as well as looking at the image brightness of the plate. The collected data will be put through a comparator process to look for changes in brightness and the fringe pattern. Both of these techniques will be used to validate if the laser beam fringe pattern did compress.